With some simple additions, you can make a toilet more accessible to someone recovering from illness or injury, or to someone who is living with limited mobility. Toilet seat accessories, such as seat cushions or raised toilet seats, can give someone the extra help they need to improve their quality of life and ability to care for themselves. 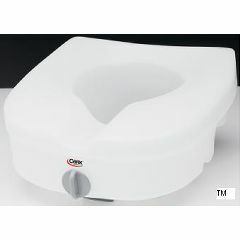 There are a number of toilet seat accessories offered by Allegro Medical that go beyond toilet safety seats and include larger items like commodes, bidets, and other medical supplies and toilet seats all at economical prices.